By now, most of you know my friend, Conner. Conner is the kind of friend that we all pray to have someday. And the kind of person that we all hope to be. He is the kind of friend who sees straight into your soul. Who gleans from a few short words the emotion simmering below the surface, who hones in on it, and who, with a few short words back says, “I see you.” And who, in so doing, who makes the colors of life brighter, its pain duller, and its joy bigger. Conner is the kind of friend who texts an audio file on your birthday that begins, “Happy birthday, Ms. Diary. I’m going to play a little concert for you,” and then goes on to fill your soul with the most beautiful piano concert you’ve ever heard. Four songs that he’s been practicing FOR YOU. Four songs that make you feel like the most important person on the face of the earth for those moments because their pure, raw, overflowing beauty is for you. On Wednesday the 23rd, we are going to our first autism convention ever in Indianapolis for the Autism Society because I’m advocating for autism. I have trouble finding words to speak, it is easier to write. Mom and me put it into a business plan and then words come through my fingers. I want to make the world a better place by changing Conner’s law, by spreading kindness, teaching the joy of helping others and caring. People aren’t appreciated for who they are. People are struggling with speaking using hand gestures, writing, signing or other ways to communicate. People are struggling with noises and may need ear muffs or sensory rooms, different hours or extra help. And people struggle with behavior not knowing how to show that they are mad or sad or confused or wanting help. People have trouble traveling or even getting in some buildings. People cannot find jobs. People cannot get help by their parents and by the State or Government. People need medicine people need special clothes. People even have no money. I call them people instead of autistic or disabled because we are people. Once that law is changed in Virginia, it will be changed state by state by next year I hope but Mom says it may take a few years with the help of God and all of you. A couple of days later, I got a text from my friend, Chloe, who was also at the conference. She and Conner made a video to say hi to the girls and sent along a picture too. I got to be ME. It’s me Conner., We had the best trip ever at the convention. I got to take pictures and learned a lot. Mom and me know more now for our second convention. We met wonderful people and so many people came up to meet me and take a picture of us together and they all spoke to me. Mom was so proud. I have a new friend that is a very good friend now and her name is Chloe Rothschild. Maybe more to come on all this fun and what we learned. I am writing this because of what happened to me. Many public figure type people were at the conference. I stood in line to meet many of them with my mom. One person who mom and I are writing a personal letter to had a comment that hurt me and made me think and made me and mom work for hours on how I felt and what I want from this incident and who I want to be. Mom says we are using no names as this is not the purpose for this. This person is not a mean person but mom thinks the person may have forgot some important facts and lessons that made that person — well public. I wore my ears the entire time at the convention. Most people like my ears but that is not why I wear them. I wear them because they make me feel good in a crowd and in places I dont always feel comfort to be in but yet I want to be there. My camera helps plenty. I can take pictures that makes me walk through the room and speak to people. I know I do a good job and I love it. I know it is an accepted job too for people not like my ears and that helps too. The person told me a few nice things that were called advice and was very nice to me and posed for pictures with me but they told me to lose my ears. They said I need to blend in and lose my ears. I said No. My ears are who I am. I am not even sure they heard me because they were talking to someone else then. Mom said she was proud. She said what I did was advocate for myself. And that I advocated for everyone that does not always follow the same beat. That is slang but I understand it. In our business plan we wrote to help me through this many good points we want to share. My ears are no different than someone wearing a ball cap with their favorite team, cowboy hat, boots. Or even wearing your favorite color or piece of clothing like a sweater. What about at the convention. Some wore nice dresses with very big heels, others dresses with flip flops, jeans, shorts, tennis shoes, coats and ties. Mom says everyone has something that gives them that extra piece of confidence that inner strength that we all need. Maybe you buy something new before you speak at an event or for an important interview. Mom says she is so impressed that I was so little when I found my ‘me’. My Mickey Ears that helped me to achieve more goals, knock down more walls, beat struggles. I dont always wear my ears as they are my special gift to me. I wear them at home a lot to just play on the computer, I wear them to most events and large crowds when i need them. I bring them in my bag even if I dont wear them just in case. Lose the ears is to lose me. I am not lost and I dont want to be. 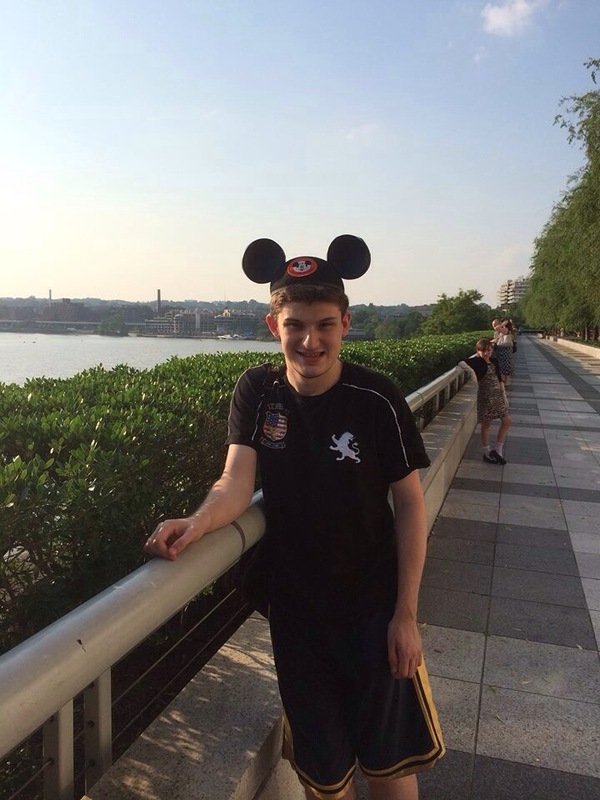 I am 22, I am an advocate, I am changing a law, I love Disney, ice skating, piano, I am a photographer, I love to learn, I love to write on our page and earn your likes, I love my Mickey Ears. I will wear them proudly with my mom by my side. I am not lost — I am me. I shared Conner’s status on Diary’s Facebook page that day and asked you all to show him your support. The world would be a far darker place without Conner and all of his glorious Connerness, I said. You agreed. And I was so grateful to see you shower him with love and acceptance and CELEBRATION of who he is. And then someone else had a way, way, way better idea. And if there’s one thing I love, it’s when someone else comes up with an awesome idea and all I have to do is share the awesomeness. So here goes. 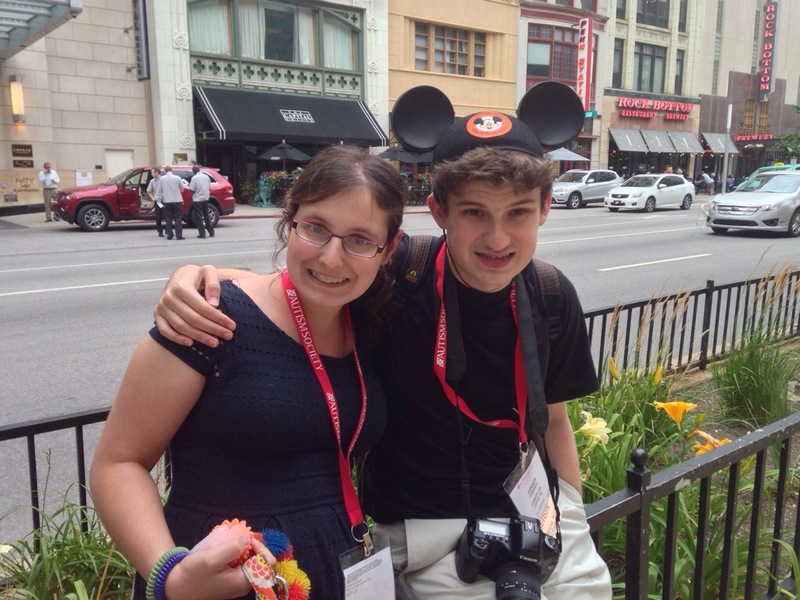 Conner is an adult on the spectrum who is a good friend, talented photographer, insightful teacher, great writer, and huge Disney fan. 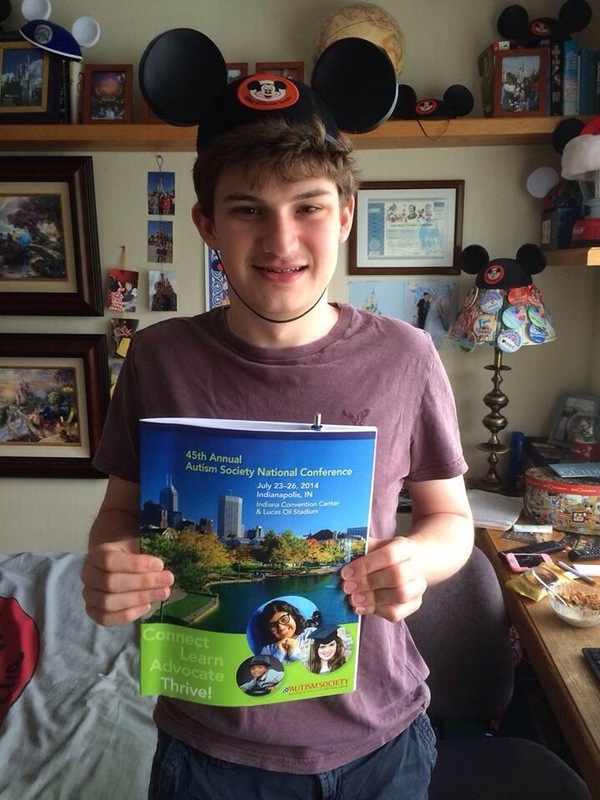 At an autism event, someone told Conner that he should remove his Mickey ears so that he will fit in better. Conner’s ears are part of who he is. He takes them off when he needs to show respect, but in many places, Conner wears his ears to show what he loves most. 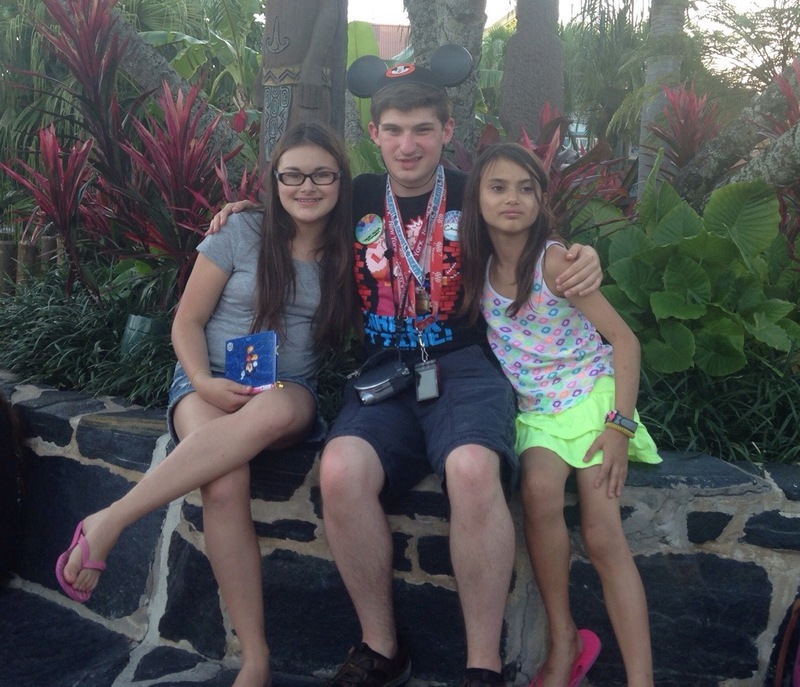 I see people wear band tee shirts and sports team hats, so I cannot imagine why Conner love of Disney is any different. I think he should be proud of who he is and be free to express his interests! I support Conner AND his ears! If you have ears, please join me in standing with Conner! And so it is that a movement was born. And I, my friends, am jumping on the bandwagon. Last night, we had a dinner guest. With only three sets of ears in the house*, I demurred. I think we can all agree that I made the right choice. * What? Doesn’t everyone have three sets of Disney ears in their house? Whatever. All ya gotta do is snap a photo of you or your kid or your grandma or your husband or your mail carrier or your teacher or your boss or your friend (or your unsuspecting dinner guest) in ears (or, as Chloe demonstrates, some facsimile thereof, put it on Twitter, Facebook or a blog, and tag it with #IStandWithConner. Then, if on Facebook, tag Conner’s Facebook page, Conquer For Conner — My Special Love, along with Autistic Speaks so that Lydia can see all of your smiling faces and revel in her brilliance in creating this amazingness. 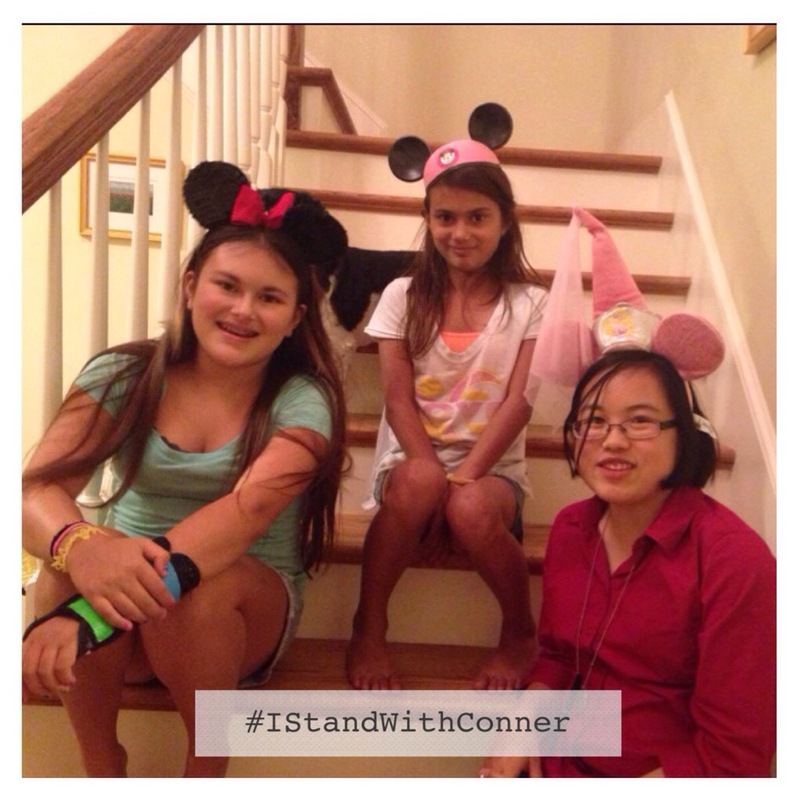 If on Twitter, tag @ConnersLaw, @LydiaAndLucy and @DiaryOfAMom and don’t forget the hashtag, #IStandWithConner, cause, well, y’all know how I feel about hashtags. I will retweet any and all. 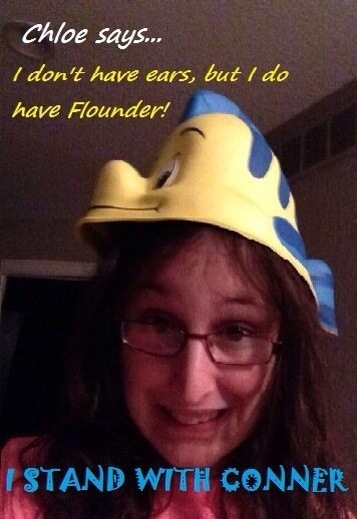 Thank you, Lydia, for this utterly fabulous idea. And thank you, Conner, for letting nothing and no one dim your light. By living this life in your way, you teach each and every one of us that it’s okay — no, that it’s beautiful, to be who we are. When I come up next, I’ll don the ears and show that I stand for Conner (which I absolutely do)! Thank you. You are Ms. Diary’s mom? It is very nice to meet you. They are my favorite non-family family. 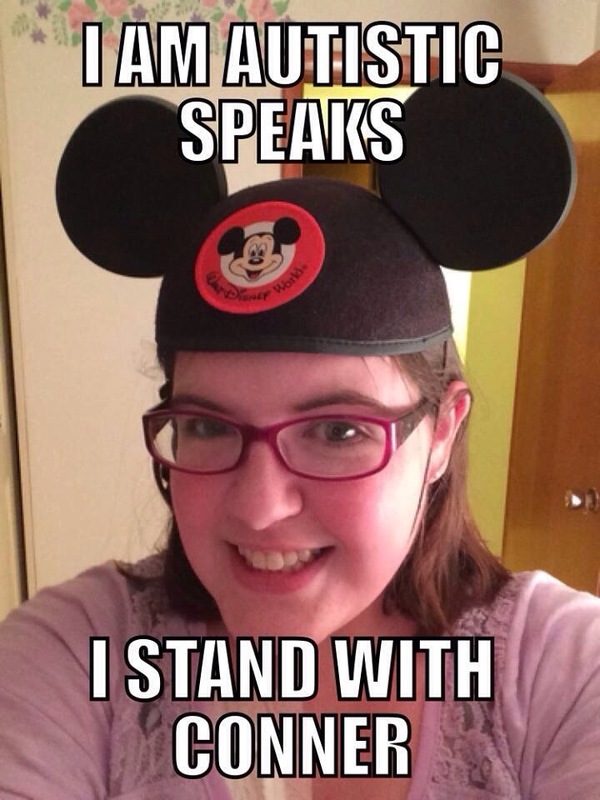 I have no mickey ears, but #Istandwithconner. I don’t have Mickey Ears, but I do have the Cow Hat that I love to wear and that some have told me I shouldn’t. I’ll snap a picture in a bit and share it! Thank you for this opportunity. I posted it! Thank you again! Thank you so much, we loved your picture.